As coastal cities like Houston continue to expand, flooding problems will grow even faster and become more critical, predict Texas A&M geographers. A heads-up to New York, Baltimore, Houston and Miami: a new study suggests that these metropolitan areas and others will increase their exposure to floods even in the absence of climate change, according to researchers from Texas A&M University. Their work is published in Global Environmental Change. The study presents first-ever global forecasts of how the exposure of urban land to floods and droughts may change due to urban expansion in the near future. In 2000, about 30 percent of the global urban land (over 75,000 square miles) was located in the high-frequency flood zones; by 2030, this will reach nearly 40 percent (280,000 square miles) as the global urban land grows from 250,000 square miles to 720,000 square miles, the authors say. The researchers also predict that by 2030 the urban extent in drylands will nearly double, reaching over 190,000 square miles, and that even without climate change, extent of urban areas exposed to both floods and droughts would more than triple by 2030, according to the study. “Urban areas exposed to flood and drought hazards will increase considerably due to the sheer increase in their extents driven primarily by socio-economic forces,” says Burak Güneralp, lead author of the study and a research assistant professor in geography at Texas A&M. The study points to significant variation in the geographical patterns of how the exposure of cities, especially to flood hazards, will change in the first three decades of the 21st century. The largest increases in urban exposure are expected in high-frequency flood zones and arid lands of Asia and Africa. In particular, emerging coastal metropolitan regions in these two continents are expected to have larger areas exposed to flooding than those in developed countries. 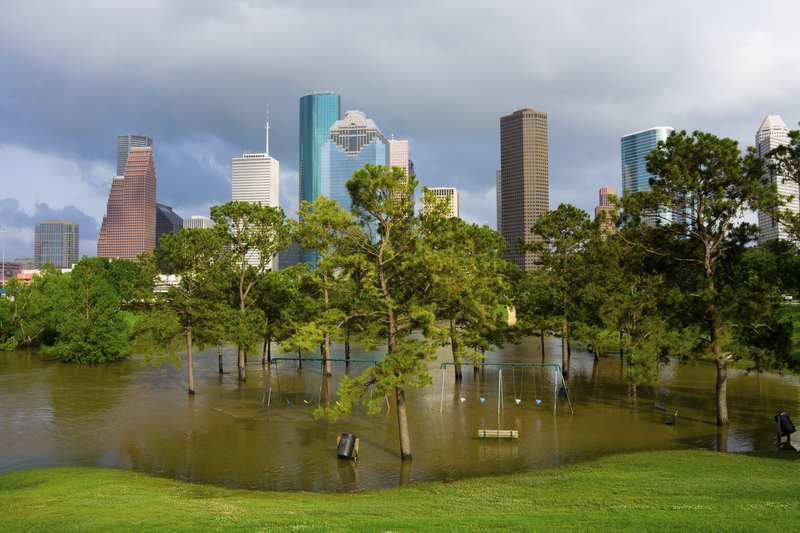 Although relatively small compared to what we can expect in Asia and Africa, in the U.S. the expansion of Houston and Miami metropolitan areas as well as the metropolitan area between Baltimore and New York is expected to increase their exposure to flooding. In addition, the expansion of many urban areas in the Southwest U.S., in particular central and southern California, is expected to increase their exposure to drought. The researchers used existing urban land cover maps and urban expansion forecasts and employed GIS analysis to identify the amount of urban expansion in flood and drought prone zones around the world in 2000 and 2030. The infrastructure requirements of all this forecasted growth would be phenomenal. For example, elsewhere, it is estimated that a staggering $57 trillion will be required to meet the global infrastructure demand worldwide by 2030. These are huge investments on infrastructure, some of which will be located in flood or drought prone areas. But the authors say there are initiatives that can be taken to adapt to and mitigate floods and droughts. These include individual cities preventing development in flood-prone zones and thus, protecting natural habitats that would reduce the likelihood of being flooded. Large-scale adoption of green infrastructure, which includes reducing impervious surface cover, can decrease the exposure of cities to high-frequency floods and droughts. Although the researchers’ focus was on the increase in urban areas, “the impact of urban land cover on river flooding is not simply a matter of increasing impervious surface cover, which causes an increase in the intensity and duration of peak river discharges,” says İnci Güneralp, second author of the study and assistant professor at Texas A&M. “Our findings suggest that future urban expansion in flood and drought prone zones will at least be as important as population growth and economic development in increasing their exposure,” the researchers add. Original story was published in Texas A&M Today. Enough rain fell in May to cover the entire state with 8 inches of water.